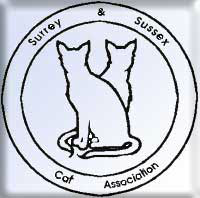 ​The name of the Association is the Surrey and Sussex Cat Association (S&SCA). To promote and encourage responsible owning, keeping, breeding and exhibition of all varieties of domestic cats. Assist and advise owners, breeders and exhibitors. Encourage members to participate in all aspects of the Association’s management and activity. Encourage active interest in the care and protection of cats. Hold shows regularly, preferably in the areas of Surrey or Sussex. Membership of the S&SCA shall be open to all. Membership of the S&SCA shall be taken to imply acceptance by the member of the aims, objectives and rules of the S&SCA and acceptance the Governing Council of the Cat Fancy (GCCF) bye-laws to which the S&SCA is affiliated. Application for membership will be by using the S&SCA application form or on-line application. Membership applications will be considered at the next scheduled committee meeting and election will be by a simple majority of those present. Joint: Annual membership. Two members of the same household or joint prefix holders or joint owners. All annual subscriptions are due on 1st January. The members at the Annual General Meeting shall decide the rate of subscription for the following year. Any members whose subscription has not been paid by the last day of March shall be deemed to have lapsed. Renewal of lapsed membership shall be by re-application and payment of the relevant subscription. These will be paid up members of the Association proposed by the committee, confirmed by the AGM and shall be eligible for re-election. A President who will be elected for a period of three years and be eligible for re-election immediately after this period. A Chairperson and Vice-chairperson who must be serving members of the committee for at least one year. They will be nominated by the committee, listed in the AGM papers and confirmed at the AGM. They will take up their post at the first meeting following the AGM. The Chairperson and Vice-chairperson may each hold office for a period of up to three years and shall not be eligible for election to the same office until after the lapse of at least one club year, but they will automatically by accepted as a candidate for election as a committee member or other Honorary Officer, if so willing. An Honorary Secretary, an Honorary Treasurer, an Honorary Membership Secretary who must be fully paid up members of the Association, shall be proposed by the committee and confirmed at the AGM. The committee will appoint delegate(s) to the GCCF as necessary. To be responsible for conducting the business of the Association. For keeping minutes of all meetings. To invite members to all General Meetings and for all committee arrangements. To prepare an annual report of the activities of the Association and shall present this report, through the committee, to the Annual General Meeting. To receive and hold in suitable Association bank or investment account(s), all monies of the Association. Pay all expenses incurred by the Association from such accounts. To ensure that all cheques drawn on the Association accounts shall be signed by any one of the nominated Officers, preferably the Treasurer, provided that such cheques shall not exceed the credit of the account. Take out suitable insurance policies as required by the committee. Present at each AGM an independently examined account of the financial position of the Association. The independent examiner will be nominated by the committee and confirmed at the AGM. To maintain the financial records of the Association and present at each committee meeting an up-to-date report of the finances. The S&SCA will be managed by a committee which will consist of the Honorary Officers (see above) and six members, who shall be elected to serve for a period of three years and shall be eligible for re-election. Two committee members will retire annually by rotation and will be eligible for re-election. All Officers and Committee present at committee meetings will be entitled to vote on items discussed at the meeting, with the exception of any member co-opted for a specific purpose - their voting rights will be limited to their specific area of expertise. In the event that there is no simple majority, the Chairperson shall have a casting vote. The Honorary Secretary must receive nominations for committee, with confirmation of the nominee’s willingness to stand, not less than 4 weeks before the AGM. In the event that there are more nominations than available committee spaces, election to the committee shall be by majority vote of those present at the AGM. Committee meetings shall be held not fewer than three times in any year i.e. the period between two successive AGMs, and members of the committee shall receive not fewer than 14 days notice of any such meeting, together with the agenda of the business to be transacted. The committee may co-opt additional members for special purposes to serve until the next AGM and may appoint such sub-committees and/or working parties as may be desirable. At any meeting of the committee, six members including two officers present shall form a quorum. Any member of the committee, who fails to attend at least half of the meetings held in any year, shall cease to be a committee member, subject to the discretion of the committee and may be eligible for immediate re-election. An AGM will be held not later than the last day in May each year. Each member shall be notified of the agenda, date, time and place of the meeting on the club website. The Honorary Secretary must receive items for the agenda no less than four weeks prior to the date of the meeting. The agenda shall include details of any business, including adoption of accounts and reports by the Honorary Secretary and Honorary Treasurer, to be discussed at the meeting. Business other than that detailed in the agenda may be brought to the attention of the meeting, but may be discussed only at the discretion of the Chairperson. All fully paid up members present at the meeting will be entitled to vote on agenda items which will be passed by a simple majority with the exception of rule changes. These require a two-thirds majority (and may only be discussed at an AGM). The meeting shall be chaired by the Chairperson or Vice-chairperson, or in their absence, a person agreed by the meeting. At any General Meeting, seven members shall form a quorum, except at a requisitioned Special General Meeting when no fewer than 50% of those members signing the requisition must be present. The Chairperson shall have a casting vote only and all members eligible and present shall be entitled to one vote. There shall be no voting by proxy. Motions to expel a member appealing against an expulsion order made the by the committee shall require a two-thirds majority of those eligible and present. An SGM may be called at any time by order of the committee, request of the Chairperson or by requisition of not fewer than twenty members. In the latter case, the meeting must be held within twenty-eight days of receipt of the requisition by the Honorary Secretary. A requisition for an SGM must state exactly the business for which the meeting is required and the committee shall have the right to declare a requisition invalid unless the business is clearly stated. Members must receive at least ten days’ notice of an SGM including an agenda, which must state exactly the business to be transacted and no other business. All officials holding equipment or assets of the Association should list and account for them on an annual basis and send details to the Treasurer at each year end. Any trophy offered to and accepted by the Association, shall become the sole property of the Association on acceptance. Any member who acts in a manner prejudicial or in a manner which may be calculated to be prejudicial to the interests of the Association as set out in these rules, may be expelled from membership of the Association, subject to appeal to the Association in a General Meeting. Any action, which may result in such an expulsion, shall be the subject of an enquiry by the committee and the member concerned shall be given reasonable opportunity to refute any charge, which may be made against them. Any member who may be convicted of any charge involving cruelty to any animal shall be expelled automatically from membership of the Association. Any member of the Association deemed to be in significant breach of the Association rules will be referred to the GCCF for investigation under Council bye-laws. Any member, (including Life, Long-term and Honorary members), suspended under the GCCF byelaws and wishing to re-join after expiration of the suspension, must re-apply for membership. Any proposal to wind up the Association or to amalgamate with another body shall be debated at a Special General Meeting and be carried by a two-thirds majority. No individual member shall derive any financial or other benefit unless so entitled by reason of circumstances other than their membership. The disposal of assets shall be in the furtherance of the objects of the Surrey and Sussex Cat Association.